I was sad to see Bangkok Bar and Port of Siam close down, but when my friend Matt told me he was taking over the property to resurrect Festival cocktail pop-up the Liquor Library in the basement and convert the upstairs into a Nordic inspired restaurant, I was intrigued and excited. I’d visited the cocktail bar and found the drinks list strong and the glassware very smart. When regular guest quester Frances was back in town for a couple of days, it seemed like a good opportunity to introduce her to the drinks and to give the restaurant a try. The menu, much in the style of Aizle, offers you a list of ingredients that will feature in the forthcoming dishes. You can opt for a five or seven course selection, with an abbreviated three course menu at lunchtime. We figured we’d look at the full extent of their offering so opted for the 7 courses with matched drinks. After apperitifs of a mushroom Manhattan and unfiltered prosecco, which Matt kindly picked up, we were eased-in with a crisply refreshing broth topping some dainty cubes of cucumber. It was a palette cleanser that would have worked as well later in the menu, but hinted at the ambitiously complex dishes that would follow. 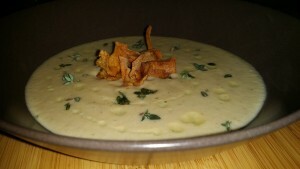 The menu proper opened with the highlight dish of the evening, a Jerusalem artichoke soup with thyme and pine oil. It was outstandingly flavour-packed and an absolute joy to eat. It rightly joins the pantheon of Soupquest exceptionals. 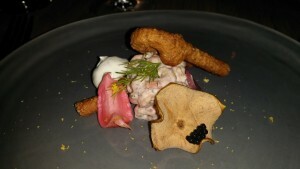 The next course was potentially the weakest as it over-stretched itself with texture and element complexity. A twist on Swedish toast skagan, the core prawn element was very good, but the sourdough baton topping was odd, the dill meringue a nice idea but not quite there, and the apple crisp a bit superfluous. We fed back to Matt, who hopefully took things in the constructive spirit we expressed them. 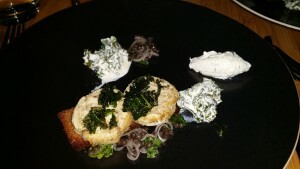 The guinea fowl was a return to better form, with the creamed kale and fragrant yoghurt particularly good. 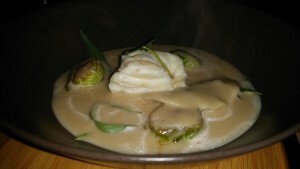 There were more soupy delights in the next dish, with a smoked monkfish broth topping a monkfish fillet. Tarragon and caramelised sprouts brought greenery and bursts of flavour. The monkfish was firmly meaty and perhaps on the edge of being overcooked but this was another enjoyable dish. 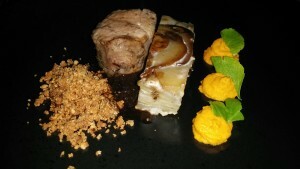 Next up we had sous vide pork fillet with a potato terrine, hazelnut crumb and carrot puree with horse parsley. The pork was excellent and there was a good range of textures, but probably one too many element. The matching drinks were of very good quality, with an excellent German pinot noir a highlight. There were two matching cocktails with the quince sidecar a winner, but the pear and rose martini rather too sweet and punchy for a multi-course food matcher. The best pairing was the maury with the chocolate dessert. After all of this, we were left to sip an espresso, then settle the bill and reflect on quite a parade of fare delivered with style and verve. 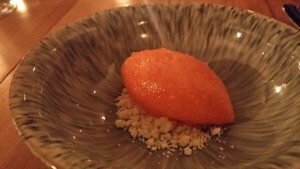 So overall, Seasons is not quite the finished article, but showed plenty of initial promise over the course of what was a really enjoyable dining experience. It’s something completely different for Edinburgh and as such is worth sampling for curiosity’s sake, alone. What you’ll find is a restaurant of charm and ambition that has an opportunity to grow into a real local favourite. I’ll reserve my scoring verdict for when I pop in for lunch, which will be soon. Add it to your list for a visit, soon. We ate: cucumber amuse bouche; Jerusalem artichoke soup, thyme, pine oil; toast skagan, dill meringue, sourdough baton, apple crisp, roe; guinea fowl, sourdough toast, creamed kale, ginger yoghurt, lentil salad; monkfish tail, smoked monkfish broth, tarragon, sprouts; pork fillet, potato terrine, hazelnut crumb, carrot puree, alexander herb; sea buckthorn sorbet, white chocolate crumb; chocolate brownie, pumpkin pureee, pomegranate, radish, cream.